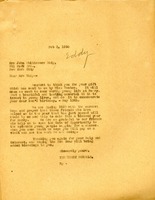 A letter to Mrs. Eddy thanking her for her gift that was sent to them by Miss. Wooten. Martha hopes that the new year will be blessed for the young people attending Berry Schools.